The rest of the gang have booked Palo for brunch at 10.00am. Tam and I had decided not to do it, but at 9.00am we change our minds and head up to Palo to see if there are any reservations left. We can get in at 11.30am, so we book up. We are all going to Palo tonight for dinner, so we figure that a big brunch will see us through until 8.30pm. We while away the time soaking up the sunshine on deck 10 and then enter Palo at 11.30pm where we are met by our server Edu from Brazil. Mandy, Mark, Deb and Matt are just finishing their brunch, so I guess this tells you something about the pace of the meal. Allow at least 90 minutes to eat brunch here. We start with a glass of champagne and we are then shown round the buffet by Edu, who explains what everything is. I particularly enjoy the croissant with boursin and prosciutto. Next is the main course where you can choose between breakfast foods or have things like prime rib or chicken. I have the Eggs Benedict and Tam goes for the Eggs Florentine. Edu also brings us a plate of pasta. Tam has been eyeing up the small tarts and cakes for dessert, but Edu insists we try the sweet pizza first. This is a thin pizza base covered in some sort if jam, with mango, fruit and marscapone cheese on top. He was right to insist, its lovely. Tam finally gets to try her tart-like dessert of passion fruit mousse along with a mouthful of berry tart. The whole meal has been excellent along with first class service. After another short lie in the sun I go off to attend another beer tasting session where I meet up with Matt and Mark. This time the beers are Boddingtons (how exotic), Stella Artois, Sam Adams and Yuengling. There is a sports quiz next, which is mostly American based. Mark, Matt and I look at each other and shrug our shoulders at most of the questions, but still manage 7 out of 15. A creditable effort I think. We then decide on another beer, the big screen comes down and they start showing Roma v AC Milan in the Champions League. A rather strange choice, but I presume there is no American sport available this afternoon. Back on deck 10 Tam and I lie in the sunshine for an hour before going to shower and start to pack. Disney Dreams is the show tonight. It seems appropriate to watch it while sipping on a Sea Breeze. Its a close run thing as to whether I prefer Disney Dreams or The Golden Mickeys. I think Dreams probably just gets the vote. We join the rest of the party in the Promenade Lounge to enjoy pre-dinner drinks. We discuss our cruising experience and all agree its been a great time. 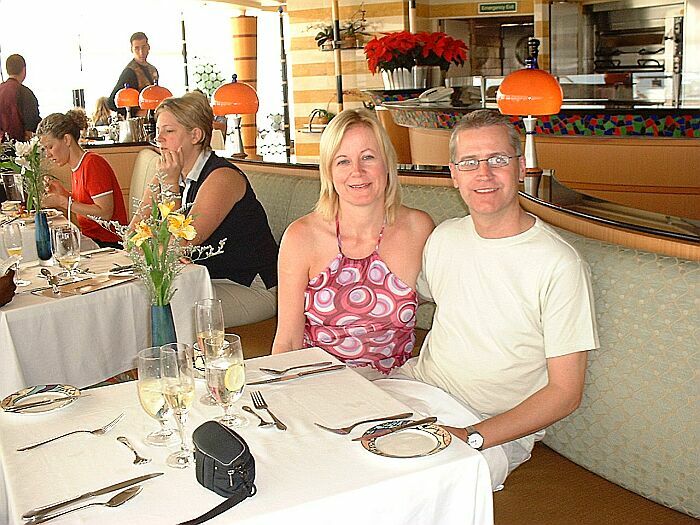 For us, cruising without the children gives a totally different feel to the holiday. The adult only areas make it much more relaxed. Im not sure I would cruise again with the children (or at least until they are older), but I would definitely do another adults only cruise. We are dining in Palo tonight and make our way there for our 8.30pm reservation. Palo is even more wonderful at night than during the day. The food is of very good quality, nicely presented and served exceptionally well. If I were to take another 7 night cruise I would try to eat here more than once. I have the Portobello Mushroom followed by the Filet Mignon. The steak is not quite as good as the prime rib from the previous evening, but is still very nice. The chocolate soufflé is a must for dessert, although I dont enjoy it quite as much as on the last cruise as Im absolutely stuffed! A couple of bottles of wine round things off nicely and the server receives a hefty tip. Back in the stateroom we change from our formal dining attire and finish packing the suitcases, which we accomplish just in time for the 11.00pm deadline. Cases placed outside the door ready for collection, we walk up to Diversions for a final cruise drink. The cruise staff are just finishing up a show, which looked very funny.
. adult nature, with everyone laughing themselves silly at one point or another. I blame the ladies; we men adjust our cravats and discuss how the stock market did today.